John Adams was born on October 30, 1735 in Braintree (now Quincy), Massachusetts. His parents were descendants from the early Puritan founders of the Massachusetts Bay Colony. Since he followed his father's advice to become a minister, he went to Harvard College in Cambridge, Massachusetts, in 1751 and graduated in 1755. Then, he decided that he didn't want to become a minister and would rather teach school. He taught at a grade school in Worcester, Massachusetts, where his interest in law grew. Finally, Adams was admitted to the Massachusetts bar and then started his own law practice in Braintree. During this time, John Adams married Abigail Smith on October 25, 1764. John Adams entered into politics when the British passed the Stamp Act in 1765. This infuriated many colonists who responded by holding riots and protests. Also, when the Townshend Acts were passed, John Adams led some protests against them. 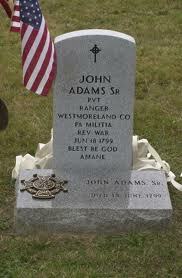 John Adams also took part in the Boston Massacre but was not killed during the fighting. Since he was a great power in the government of Massachusetts, he had jailed six of the eight red coats who were fighting that day. The colonists continued to argue against Britain, and John Adams supported the idea of the Boston Tea Party on December 16, 1773. After this, John Adams became a delegate from Massachusetts in the first and second Continental Congresses. He argued strongly that the colonies separate from England and demanded a unanimous vote for it to happen. John Adams signed the Declaration of Independence along with other delegates such as his cousin Samuel Adams. John Adams was also sent to Paris along with Benjamin Franklin to try to convince France to join the war and side with America. John Adams arrived back in America just in time to participate in the Massachusetts Convention. He composed the Massachusetts Constitution in 1780. Finally, John Adams had to join Ben Franklin again. This time, they were to make a peace treaty with Great Britain to formally end the Revolutionary War and give America independence from Britain. Then, on October 19, 1781, the Treaty of Paris was signed and approved. Next, Thomas Jefferson was sent to Paris to replace Ben Franklin. Adams and Jefferson worked on how to pay off America's debts to the countries that had helped them win the war. In 1785, John Adam was made the first U.S. ambassador in Britain so that America and Britain could secure their trading rights. By the time John Adams had returned from London, most of the United States of America had approved the Constitution of the United States. In the vote to become the first U.S. President, John Adams and George Washington competed to win the majority of the votes. George Washington won and John Adams was approved to be vice president. John Adams was also part of the federalist party who wanted a stronger central government. In 1796, John Adams ran for President against Thomas Jefferson. John Adams barely won 71 to 68. During his time as President, he noticed that the French Navy was attacking U.S. merchant ships the West Indies. When Adams sent delegates to France to organize a peace treaty, the French demanded $250,000. The delegates were hurried back to America where they began to organize an army to fight against France. Finally, the U.S. and France were able to organize a peace treaty and the U.S. avoided another costly war. After his term as President ended, he retired and rebuilt his friendship with Thomas Jefferson since it broke apart when they were on opposite political parties. John Adams died on July 4, 1826, on the same day that his friend, Thomas Jefferson did. They died within hours of each other.